At Encore, we take a different approach to furniture shopping. We have compiled some of the most beautiful pieces of furniture from homes across the valley and offer them to you with the convenience and economy of consignment prices. Our furniture showroom in La Quinta spans over 23,000 square feet and is filled with friendly design specialists that are dedicated to helping you achieve your design goals throughout your entire home. For a hassle free shopping experience, we invite and encourage you to visit us today. At Encore, we are prepared to assist you in the sale of your unused home furnishings and home decor. 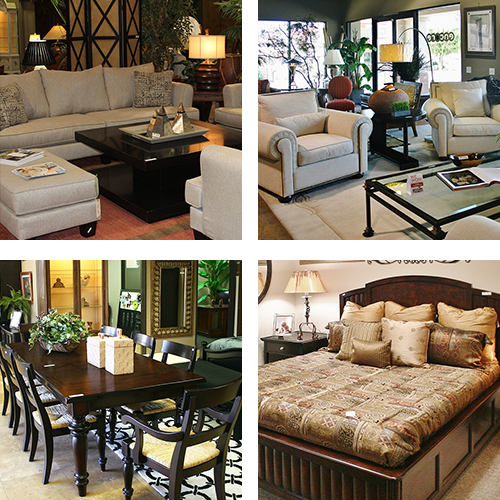 From sofas and sectionals to lamps and rugs, we are proud to consign quality home furnishings from across the Coachella Valley. Consigning with us is simple. Send us a photo of the items you would like to consign and our design specialists will assess and review it to ensure the utmost quality and style. We will promptly contact you to discuss pricing and facilitate the pickup of your furniture. We’ll strategically stage your item in our showroom to maximize visibility and sales. To learn more about the benefits of consigning with us, please click on the button below. We know that not everyone knows what type of furniture works best in their home. We take the time to fully understand your needs and personal style to ensure you find the best furniture for your home. Unlike other furniture companies, we’re open seven days a week to ensure that you can get quality, practical home furnishings any day of the week.